I have been noticing that my faithful moisturizer has not been adding enough hydration to my skin. Julia, from Agape Skin Care in Katy, TX suggested that I try coconut oil. When I told her I had tried it and didn't like it, she said I needed to look for Organic, Virgin, Cold Pressed and Unrefined Coconut Oil. I doubted I would be able to find one without going to a specialty market, but I found this one on the shelf of my local grocery store. It is SO much different than the other type of coconut oil I've tried. Before I used it, I transferred a small amount of coconut oil out of this jar and into a travel container. 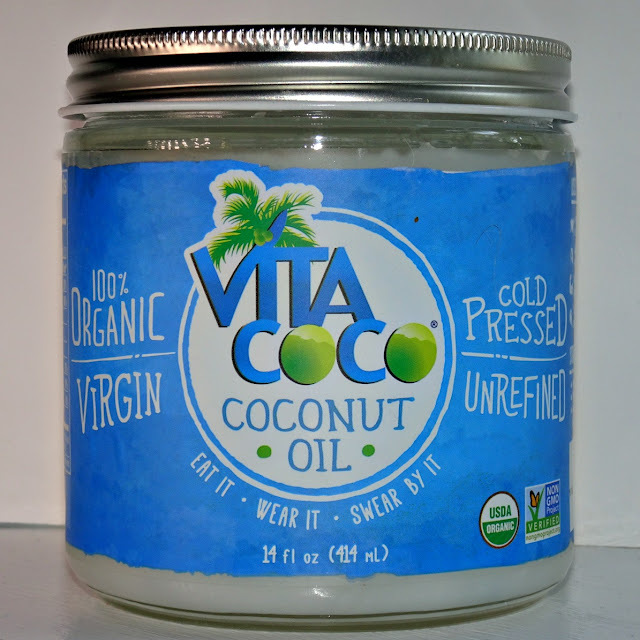 Coconut oil solidifies when cool, but will turn to oil with the touch of your fingers. I normally do not like the feel of oil, but this one is feels great to me. I have been applying it nightly for over a month now and I am really happy with the results. Unfortunately, it does not seem to hydrate my hands or lips enough. I did crave an Almond Joy the first few times I used it! If you are a fan of DIY treatments or want to try something new, I encourage you to give Organic, Virgin, Cold Pressed and Unrefined Coconut Oil a try! I'd love to hear about your coconut oil beauty tips! I love squishing about a teaspoon of organic coconut oil in my mouth every morning for 60 secs and spitting it out. It really cleanses and makes my gums and teeth happy!